1976 Born in Shizuoka Pref. in Japan. I was a 'water baby'. And I went backpacking all over the world during my school days. Now, I am devoted to freediving after bouncing back from the setback of leaving my old job which was coral conservation. 2008 May. Acheived PB in all events in the indoor Japan cup, and won the taurnament. 2008 Sep. Competed in World championship as one of the Japan's representatives. 2008 Dec. Set Japanese record in DYF (200m). 2009 May. Won my second consecutive indoor Japan cup. 2009 Aug. Took part in World championship again and stood on the podium with a bronze medal in DYF 219m. 2010 Jan. Moved to Okinawa and started training for the world championship in Japan (30/Jun/2010 to 10/Sep/2010). 2010 Apr. Moved to Hawaii and aspire to achive new levels in Constant. This year, I'd like to make the most of freediving. I was born on 7th Jun 1983. I have started skin diving and spear fishing from University. 2009 Feb. one of my friends invite me to join freediving team, and I seriously started freediving. 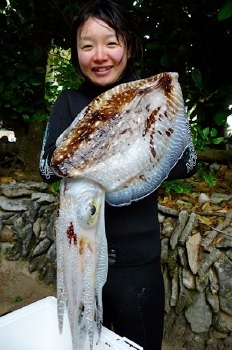 At the same year, I attended spearfishing Japan cup as a first woman player in Japan. After started skin diving, my feeling was changed to be closer to nature than before. Also, ocean made me various experience and many encounters. I'd like to thank to the ocean and live with the ocean.